Competition Results 2011 have been sponsored by Jim Blurton Specialist Shoes, the leading supplier of bar shoes by a World Class farrier. With just over 100 pre registered apprentices, the 9th Stromsholm apprentice seminar held at the BFBA Headquarters at Stoneleigh was the most successful ever. The day was all about education, with six distinguished farriers on hand to give a mixture of lectures, demonstrations and mock oral exams. As always, the day started with a multiple choice theory paper which everyone completed. The 1st and 2nd year’s were under the watchful eye of John Suttey AWCF (a part time lecturer at Warwickshire College) who explained the importance of tool maintenance and basic shoemaking. 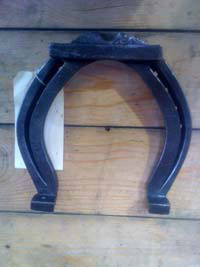 The 1st year’s were asked to make a pair of unclipped front shoes, while the 2nd year’s were asked to make a pair of plain stamped hind shoes, toe clipped. John also gave a power-point presentation and shoemaking demonstration to back up the basics of good shoemaking. Jonathan Nunn AWCF looked after the 3rd year’s, giving a shoemaking demonstration and advice on fullering and side clipping front shoes. All the 4th year’s had an opportunity to have a face to face mock oral (similar to the DipWCF exam) with either Doug Bradbury FWCF, Andrew Poynton FWCF or Simon Curtis BSc (Hons) Hon Assoc RCVS FWCF. 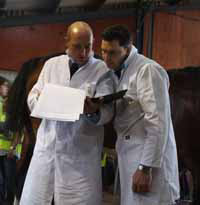 The apprentices were asked to discuss different topics such as X-rays, shoes, anatomy and the function of the hoof and leg. As always this was one of the most beneficial parts of the day for many of the apprentices. 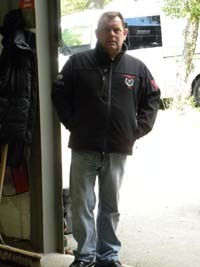 Christoph Muller, a farrier from Germany was also on hand as a representative of one of the sponsors, Vettec. Christoph was able to give the 4th year’s valuable tips on how to get the best out of these products. Later in the day, Christoph gave a power-point presentation to the younger apprentices about Vettec products. While the results from the day’s shoemaking were being added up, Andrew Poynton addressed all the apprentices and gave them a very detailed presentation on the correct use of modern materials, showing a number of interesting case histories. The final lecture of the day was by Simon Curtis who concentrated on the subject of foot balance. With the use of slow motion video and graphics, Simon was able to keep the apprentices attention while going into the detail of proper hoof balance. As always, many thanks to the lecturers, sponsors and the Stromsholm team for putting on such an interesting and educational day. 1st - Eddy Channon Jr.
To receive individual marks please email Claire. 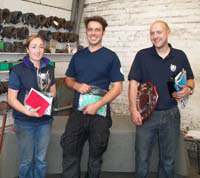 Many thanks to all who supported and travelled long distances to compete again this year, even with an event at head office our entries where full, with top farriers and apprentices from all over the country. Very well done Gary Darlow for winning back to back championships. Thanks to Grant Moon and Jim Ravenscroft for judging, both had a hard time finding winners. As always thanks to our sponsors Jim Blurton Tools for their continued backing in these tough economic times, and the Royal Bath & West Society for the use of the best shoeing floor in the country. And our horse owners for some champion hunters to shoe. We look forward to next year with thoughts of making the competition bigger and better by adding in some more classes if at all possible. And lastly apologies to the prizewinners for the mix up in the scores, especially Simon Legge who was called up first in the restricted class only to find he had actually be placed second. Thankyou to you all for the gracious way you accepted the mistakes made (hands up me). We do already have a new program for next year to avoid the same happening again. Congratulations to the English Team (sposnored by Better 4 Hooves) for once more securing the BFBA International Team Horseshoing Championships. 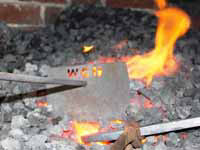 Full results and individual marks can be viewed on the Forge Magazine website - click here. 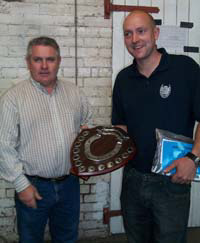 George Broadhead Shield awarded to the Open competitor with the greatest combined Open/Gas points - Steven Beane. "A big thank you to our judge Nigel "boom" Fennell AWCF, Louise @ Mustad, Eastlake & Beachell, WCF, Mrs Sally Hicks, Stephen Hill AWCF, & top Steward, Tim Fieldwick, and of course a thanks to all our competitors for another success Show"
A huge thank you to Michele Beard for taking the photographs at the show and for allowing us to use them. To view the Photo Gallery click here. Judged by Mr E. O'Shaughnessy AWCF, the day was a huge success with plenty of ' craic ' had by 44 competitors from all over Ireland, Scotland and England, with many more spectators who turned out to enjoy the days events. Organisers Alwyn and Erica McKeown would like to say a BIG thankyou to the judge, all their helpers and sponsors including Rowan Riding Wear, Life Data- Karen Zetsche who travelled from Germany to attend, BHS, Ariat, Crossan Farrier Supplies, Massey Butchers, Stromsholm, Handmade Shoes UK, Breakaway Horseshoe co., Mr Martin and Sam Payne, Mr E. Channon, Christine and Peter Ruffold, and especially those who competed, well done and hope to see you next year for another great day! 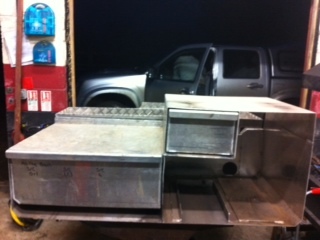 For full results and a break down of marks please visit www.forgemagazine.co.uk. 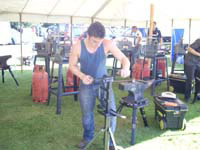 Peover Shoemaking Competition held on Sunday 7th of August at Cheshire Game and Angling Fair was another successful day for this small but long running competition. With Judge Jonathan Nunn AWCF working hard all day to judge the high standard of shoes in all three of the classes. Once again we would like to thank our generous sponsors: Swan Forges, Handmade Shoes, B.L. Farrier supplies, Derek Gardner, Stromsholm, Harris Gas, Forge & Farrier, Mustad, D.B. Crane Ltd, Cottams, and Nigel Fennell. Thank you to all competitors. We look forward to seeing you all again next year! Class 2 - 1st and 2nd Years. Class 3 – 3rd and 4th Years. 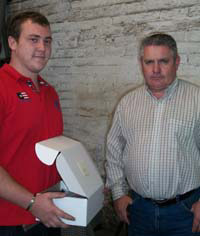 Winner of the B. L. Highest Marked Apprentice Shoe: Kris Parker. Photo Gallery from the day can be viewed by clicking here. 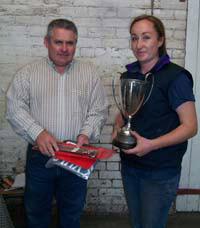 This year’s Tockwith Competition which was held on Saturday 6th of August at Tockwith show was a very successful day. With Judge Mr. D. P. Smith AWCF taking on the task of judging a newly integrated shoeing element to Tockwith, which saw 14 Open competitors competing against one another to win the prizes on offer. 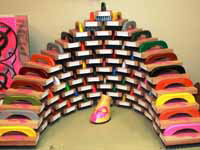 In addition to this remained the speed Shoemaking classes which have been held in previous years. A high standard was found across the four classes throughout the day. We would like to thank our generous sponsors: Swan Forges, Handmade Shoes, Yorkshire Farrier supplies, Energas, Stromsholm, Mustad, Arthur Cottams, and Londonderry Supplies. Thank you to all competitors and to everyone who helped to make the day a success. We look forward to seeing you all again next year! Best Dressed foot: Steven Beane. To view the full Photo Gallery click here. To see other YFEDA events and lots more, visit www.yfeda.co.uk. 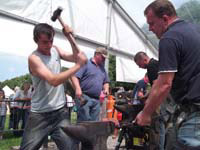 Leek & District Agricultural show in North Staffordshire on 30th July held for the first time a shoemaking Competition. 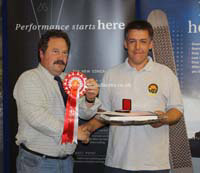 Gary Darlow and Russell Jones judged the competition. Competitors came from all over the country. 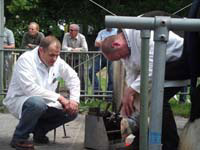 From the start of the competition right through to the end of day presentation there were crowds of general public watching the event, thus making the shoemaking one of the main attractions of the whole day. We split the apprentice classes so that prizes were given to 1st year -2nd years - 3rd year- 4th year to encourage the apprentices to enter their section so being able to compete on a level playing field. The intermediate and open classes were hotly contested; the Eagle Eye class proved to be very successful although in some cases the competitors eye mustn’t have been looking direction! Trevor, Clare & Joshua Frost would like to express their sincere thanks to all the sponsors for providing such fabulous prizes and prize money. 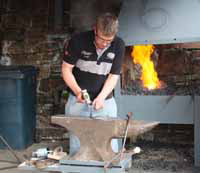 Stromsholm Farriers supplies-Webber’s Farrier Supplies - Arthur Cottam & Co - Londonderry Forge Supplies- Mustad -Horseshoe & Farrier Supplies- MNC ltd –System Smart CCTV- Leek show –Forge Magazine-Forge & Farrier Magazine. The leek show committee have unanimously agreed the shoemaking competition will be being held at the show for the foreseeable future. Massive thanks to the sponsors!! Looking down on Pitstone Green Business Park, home to Handmade Shoes (UK) Ltd, you could not fail to be impressed by the array of farriery vans (complete with gazebo’s, just in case! ), ready and waiting in anticipation for the start of the largest shoemaking competition in Europe. Back after a year off, the 6thHandmade Shoes (UK) Ltd Shoemaking Competition welcomed 131 competitors to its premises to compete for a prize fund in excess of £15,000. 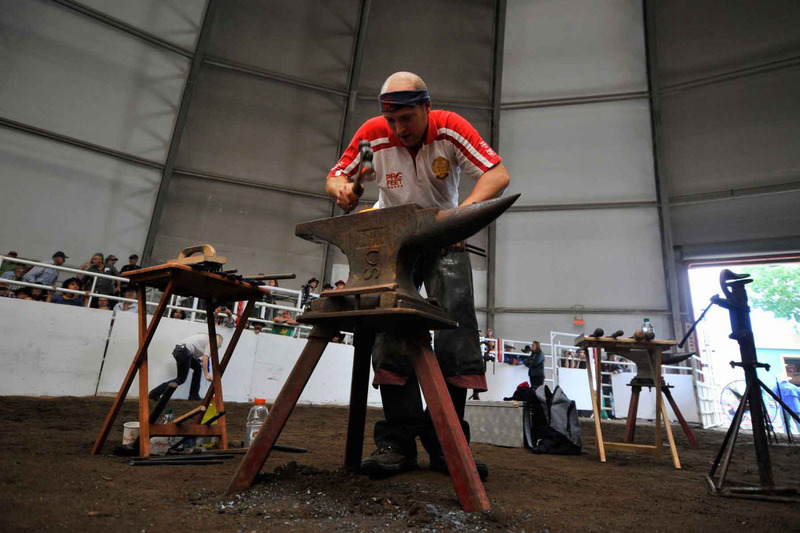 With Advanced, Intermediate and Apprentice Championships to contest, farriers and apprentices alike were eager to get started. 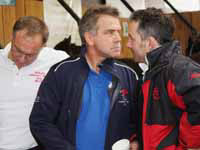 Hardly needing an introduction to their two eminent judges, six times World Champion Grant Moon AWCF and three times (and current) World Champion Steven Beane AWCF, the day kicked off with a competitors meeting and a chance to scrutinise the specimen shoes. Class 1, the ‘Derek Gardner Front & Hind Shoes’, included a concave front and hind with a hammer clip for the 1st& 2ndYear Apprentices, a three quarter fullered front and hind, hammer finish, for the 3rd& 4thYear Apprentices and a fully fullered front and a three quarter fullered hind for the Advanced and Intermediate farriers. Derek has generously sponsored this class for the last 6 years and prize winners were treated to hammers, fullers, stamps and pritchels. Results: James Elliot (1st& 2ndYear), Alex Collier (3rd& 4thYear), Harry Garner (Intermediate) and Jason Gajczak (Advanced) secured early wins to get the competition off to a flying start. 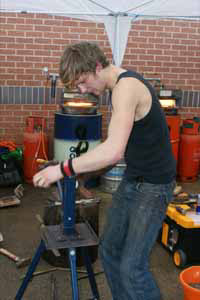 Class 2, the ‘Jim Blurton Bar Shoe Challenge’, included a pair of egg bars for the 1st& 2ndYear Apprentices, a hammer finished pair of three quarter fullered straight bars for the 3rd& 4thYear Apprentices, a pair of heart bar hinds for the Intermediates and a rasped and filed pair of heart bar fronts for the Advanced competitors. 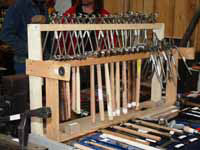 Jim donated tools to the apprentice classes and barshoes for the Intermediate and Advanced classes. Results: James Elliot continued his winning streak in the 1st& 2ndYears Apprentices, Josh Wilson won the 3rd& 4thYear Apprentices, Harry Garner again won the Intermediate section and Matt Randles secured a convincing win in the Open. A short break for lunch and a well earned rest before the ‘hotly’ contested ‘Tosaky Forge One Heat Fast & Furious’. Each year this class produces some of the most admired shoes of the day and some of the most damaged tools too! Ten minutes of beating metal following the pre-heat period produced an amazing collection of shoes – plain stamped, fullered, clipped and unclipped, rolled toes, stud holes and therapeutic to name just a few. 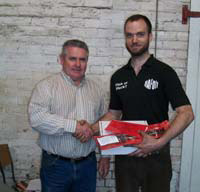 Tony Kingery had kindly donated Tosaky Forge Knives to the victors in this class. Results: James Elliot once again secured top place in the 1st& 2ndYears, Jake Elliot won the 3rd& 4thYears and Tom Stevens and Jon Atkinson won the Intermediate and Advanced respectively. The final class of the day, the ‘Kevin Bacon’s Hoofcare Products Judges Surprise Shoes’, completed the marathon of shoemaking tests. From Grant Moon in the 1st& 2ndYears was a plain stamped front and hind made from 14” of ¾ x ½. Steven Beane had made a concave lateral support front made from 13” of ¾ x 3/8and a side bone shoe from 14 ½” of 1” x ½ for the 3rd& 4thYear Apprentices. For the Advanced and Intermediate competitors Grant’s specimen was a ¾ fullered front break over shoe and Steven’s a heel and feather hind. Winners of the class received lovely wine and jackets courtesy of Kevin Bacon’s Equine Products. Results: Robbie Watson-Greaves posted a convincing win in the 1st& 2ndYear Apprentices class, Jack Casserly won the 3rd& 4thYear class, Jack Harper the Intermediates and Jon Atkinson the Advanced. A wash and change into something ‘funky’ led the competitors, the staff , friends and family to the black tie Summer Ball and Presentation Dinner. A superb dinner preceded the nervously awaited and much sought after Championship announcements. Placed consistently throughout the competition Robbie Watson-Greaves was victorious in the 1st& 2ndYear Apprentices with Daniel Rabin Reserve Champion. Alex Collier edged ahead of Ben Grange to take the title in the 3rd& 4thYear Apprentices whilst Harry Garner capitalised on his early lead in the Intermediate classes to win the Intermediate Championship with Dan Preece in Reserve. 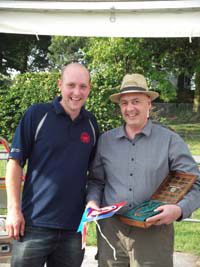 Victorious in the Open Championship and winning himself a ton of Handmade Shoes (amongst other prizes) was Jon Atkinson, with Gary Darlow a highly popular Reserve Champion. 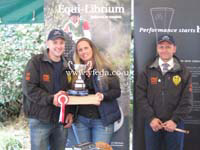 Each year the competition is extremely fortunate to be in receipt of a wonderful selection of prizes for those competitors achieving top placings. The generosity of the sponsors is remarkable and those coming out on top walk away with a great ‘booty’ bag! Quite simply the competition would not be what it is today without their contribution. 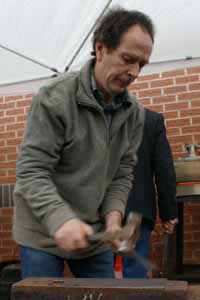 The B L Farriers Forge given to a competitor of ‘Billy’s Choice’ was won by ‘seasoned competitor’ Paul Duddy for his continued support of the Handmade Shoes Competition and forever turning up without one! A remarkably generous auction prize list instigated minor bidding wars to help raise £13,690 in aid of Breakthrough Breast Cancer. The sale of the latest catwalk item – neon bracelets and necklaces – by our hard-selling Table Captains helped to raise a further £2,698 bringing the total to a fantastic £16,388! Celebrations continued well into Sunday morning, aided by a champagne reception kindly sponsored by Pierre Mage (Mustad) and wine kindly sponsored by Steffan Heimes (Pferd) and Sam and Mac Head (MNC), completing a superb day. The Handmade Shoes Competition – and Summer Ball – is an occasion not to be missed. A highly organised, professional competition rounded off with a party of farriers, friends and family; camaraderie and character’s! Billy and Lucy Crothers would like to thank all of the sponsors for their continuous and generous support, everyone that donated an auction prize, the staff at Handmade Shoes for their hard work and the competition stewards who gave up their time. A special thank you also to James Henderson for kind permission to use his field and marquee and also to all the competitors and those that attended in the evening to celebrate the day’s events and to support such a worthwhile charity. Full results and individual marks can be obtained by emailing Claire. Individual marks can be obtained by emailing Claire. It was our pleasure to welcome our judges David Smith and Peter Cronin to the competitions and our thanks go to them for all their hard work over the three days. I would also like to thank our stewards Paul, Phil, Kevin, Kay, Steve & Dave for all the work that goes into the smooth running of the competition, and all the helpers who contribute so much time. All the classes were well supported, with over 30 entries for the apprentice shoemaking. I would like to thank all the competitors for their continued support, and for making it such a friendly and successful show. Our grateful thanks for their continued support go to our sponsors, Corralls Coal Merchant, I S & G Steel Steel Stockholder Ltd, Stromsholms Ltd, Kent County Agricultural Society and also to Dowle Fencing for erecting the fencing around the stand. CALGARY – No one ever suggested his first Calgary Stampede win was a fluke in 2009. And no one questioned victory No. 2 under the Big Top last July. But now? Steven Beane’s reputation as a world-class blacksmith has officially been dipped in bronze. 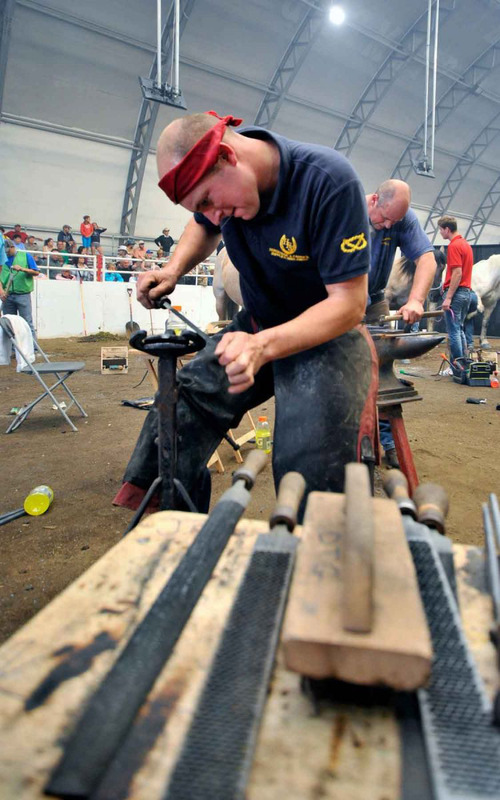 Beane, from North Allerton, Yorkshire, England, captured his third consecutive global title at the Stampede’s 32nd annual World Championship Blacksmiths’ Competition under the Big Top on Sunday morning. 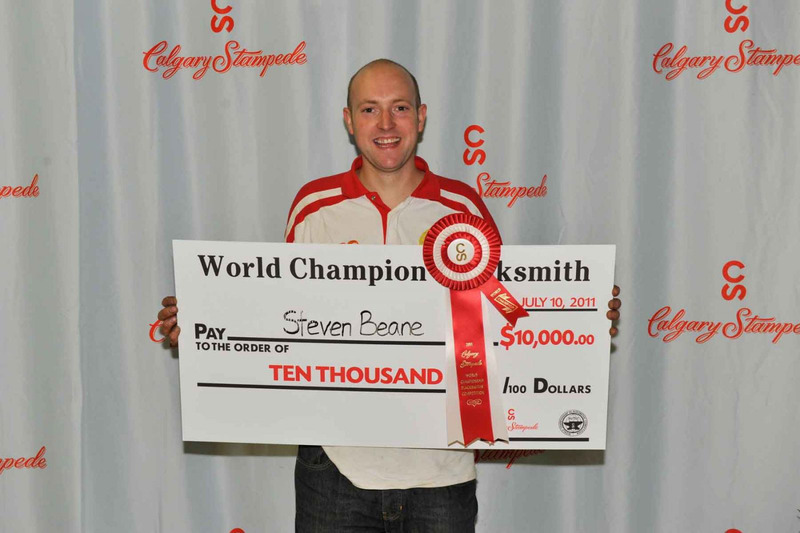 Beane is the first competitor to win back-to-back-to-back world crowns at Calgary since Welshman Grant Moon snared his fifth straight WCBC title back in 1992. And Beane’s competition in Sunday’s five-man final made the feat that much more impressive. Stoking coke forges around the Big Top floor were Moon, with six world titles to his credit, fellow Cardiff resident Billy Crothers, with five Stampede wins, and Paul Robinson of Northern Ireland, who won the WCBC crown in 2008 before Beane went on his current run. “It’s very hard to win Calgary every time. But this year, with this field of competitors, there was nothing between us, you know?” said Beane, 32. “These guys are all friends and colleagues of mine. The full top five were from the U.K., which is quite an achievement. Beane takes home the winner’s cheque for $10,000, as well as a gold-and-silver Stampede championship buckle, a limited edition bronze trophy, and a champion’s jacket. Final standings showed Beane with 152 points. Robinson was second with 115 points, Derek Gardner of Scotland placed third with 111, Crothers was fourth at 102 and Moon finished fifth at 95. Nathan Powell of Water Valley, Alta., was the top Canadian, finishing 10th overall. The WCBC has not crowned a Canadian champion since Bob Marshall in 1986. “It was an ideal lineup, wasn’t it? First-class competitors. Steven Beane, Billy Crothers, Derek Gardner. Just a fantastic final five. Probably the best final five I’ve ever been part of, anyway,” said Robinson, who hails from Portadown, Northern Ireland. 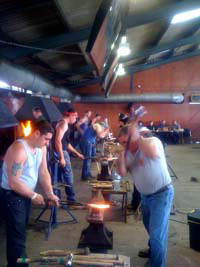 The WCBC, known as the “Olympics of blacksmithing,” attracted 56 modern-day Vulcans from 13 countries around the world this summer: England, Denmark, New Zealand, Scotland, Australia, Ireland, Norway, France, Wales, Belgium, Northern Ireland, the United States, and Canada, with more than $50,000 in cash and prizes up for grabs. Sunday morning’s semifinal saw the 10 remaining contestants shoe the front feet of a light draft horse in 60 minutes. The finalists were given another 60 minutes to shoe the hind feet of that same horse. 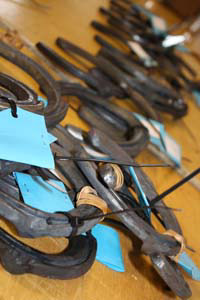 Judges Ian Allison of England and Dan Haussman of the United States based their decisions, through a blind judging process, on shoe forging, finish, and nail placement, as well as preparation and balance of the horses’ feet. Henrick Berger of Denmark, Scotland’s David Varini, Jim Quick of the United States, and Yoann Policard of France also made the top 10. Moon, Robinson, Varini, and Crothers won the four-man team championship, splitting a prize pot of $8,000. Beane was named Forging Champion, taking away $1,000, while Robinson was tapped as Shoeing Champion, pocketing the same amount. Doug Taylor of Blackfalds, Alta., took home Artistic Champion honours, while Jason Bromley of the United States was named Rookie of the Year. 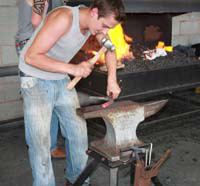 At Saturday night’s Metal Art Auction and Metal Art Showcase, Taylor was named overall traditional forging champion, Patrick McIvor of Salmo, B.C., took overall non-traditional forging champion honours, and Rodney King of New Zealand and England’s Jonathon Nunn teamed up to win the potluck forging category. 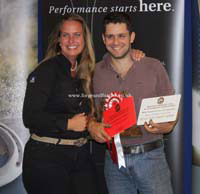 To view results from all the classes and all competitors click here. To view the FINAL STANDINGS click here. 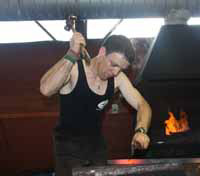 Last night Steven Beane became World Champion Blacksmith at the Calgary Stampede for the third year running. 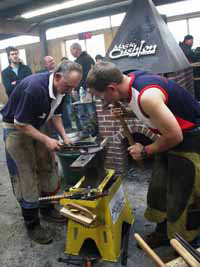 Watched with baited breath by many of us on UStream, the competition - known as the Olympics of Blacksmithing - was a tremendous success for UK farriery with Paul Robinson (winner in 2008) Reserve World Champion and Billy Crothers, Derek Gardner and Grant Moon completing the top 5 placings. 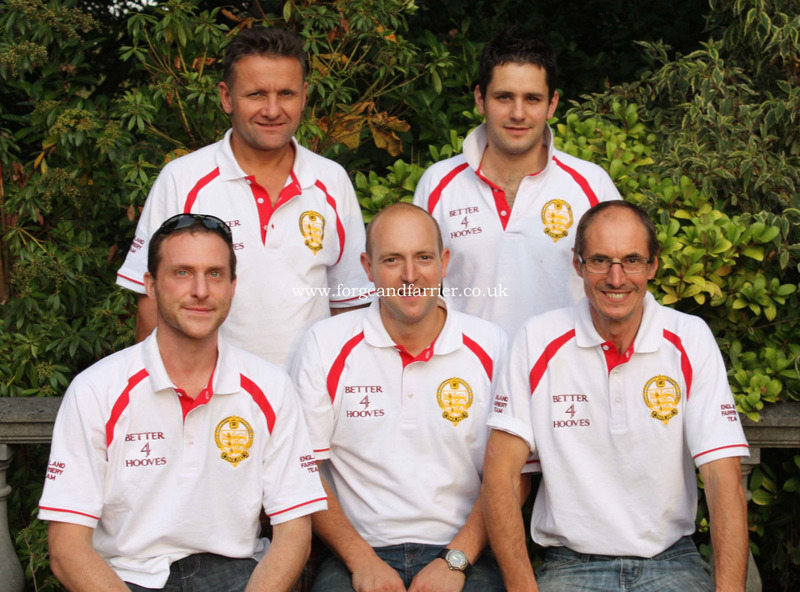 Seven UK farriers made it into the Top Ten. At the time of writing we are awaiting official confirmation of the exact placings and scores from the Stampede office. Results will be published here as soon as we have them. Huge congratulations to all of you, you've done us proud and have a safe journey home! With thanks to Alan Murdoch for providing the results and images. 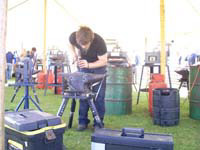 The 2011 Lincolnshire County Show Farriery Competition were held on the 22nd & 23rd of June 2011. This year saw more competitors than ever before making for a good competition. I would like to thank our Sponsors, Farriers Choice and Arthur Cottam & Co and Saxilby Ridding school for providing good footed, well behaved horses for the two days. 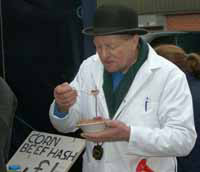 This Years Judge was Steve Cox-Rusbridge. I would also like to thank Adrian (Middi) Middleton, Andy Welch, John Lehtinen, Glyn Trundle and his Apprentices for all their help over the two days making a smooth running competition possible. Lastly a massive thank you to the “Man with the Mike” Mark for entertaining us and educating the Crowds over the 2 days. We hope to see all competitors back next year plus more as more fires and new fans mean we can provide more spaces. 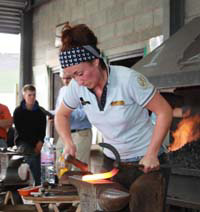 £100.00 Prize Money & Bronze Medal - W.C.Farriers. 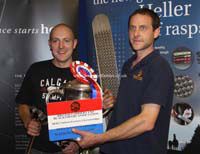 £100.00 Prize Money & Silver Medal - W.C.Farriers. 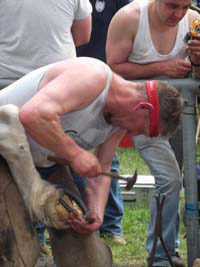 £80.00 Prize Money & Bronze Medal - W.C.Farriers. £25.00 Prize Money - Winner. 1st & 2nd Year Apprentice Shoemaking. 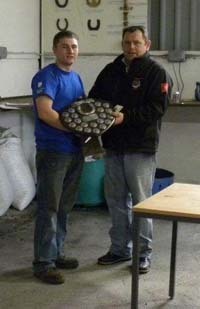 Ellis Dawe & Derek Lloyd Challenge Trophy. 3rd & 4th Year Apprentice Shoemaking. 1st - Gary Darlow & Richard Slater. £100.00 Prize Money - Sponsored By Richard Ellis. Photo Gallery online, visit here. For individual marks please email Claire. Photo Gallery online, visit here. Thanks to Stephen Hill for providing the photo's. Also of note the best dressed foot of the week was Simon Wheeler with a 9.6 score. Many thanks to our two judges Andy Martin and Gavin Golby they worked hard all week starting early and finishing on two days after 7 o’clock grabbing food and drink when they could and as the scores show it was not an easy job to find winners .In all they judged 196 competitors work. Many thanks again. 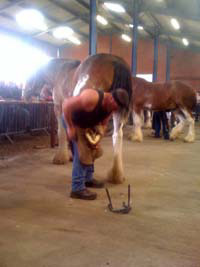 Also a big thanks to our sponsors Richard Ash Horseshoes, Legg Brothers (steel), Northover Coke and the Royal Bath &West Society and our many horse owners for the horses, without whom we could not put on a great horseshoeing competition. And a final thanks to the ‘Crew’ that make it all happen. We would like to thank all the competitors for supporting another two days of great competition and to congratulate all the prize winners. I would personally like to thank Allan and Jim Ferrie for their skills in judging the competitions over the two days. 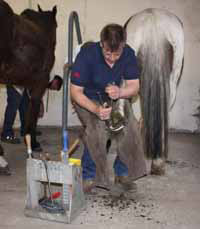 Yet again, we had full shoeing classes with Shires on the first day and Suffolk Punches on the second day. For the first time apprentices were given their own therapeutic class which was well received and we also introduced an Eagle Eye competition, a fun class which was well attended with thirty two entries. We hope to see you all again at the 2012 Suffolk Show; please note that the dates have changed because of the Queen’s Golden Jubilee and the Show will be held on Thursday 7 and Friday 8 June 2012. 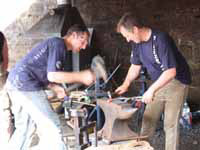 We will also be holding more competitions and training days during the year and will publish dates and further details with the Forge & Farrier website as soon as they are confirmed. 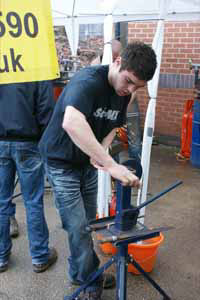 This year’s competition was once again a great success with a good turnout of apprentices which was very encouraging. A big thank you goes out to all the sponsors in particular Handmade Shoes (UK) with their very generous support in the gas forging and this year Mustad also donated prizes in kind, without the help of these companies it would be very difficult to run competitions. There are many other sponsors that also need to be thanked and also to all those who helped on the day. Next year, it is hoped to have a seminar on the Friday to celebrate the opening of World Horse Welfares new indoor school, cafe and lecture facilities. Anyone out there that would like to sponsor steel or coal or prizes in kind please contact Donald Nicol by E-mail donald@nicolfarriers.com or Call 07785745956. Full photo gallery avaiable to view here. Full results are available, please email Claire. 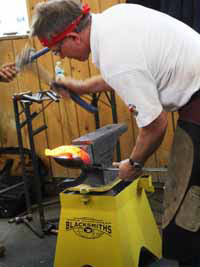 In the last week of February a community of Farriers converged on Richmond, Kentucky for the first ever team competition on U.S. soil, the first annual World Horseshoeing Classic. The event was held at Kentucky Horseshoeing School which is a brand new state of the art facility that is second to none. The table was set and it was going to be the combined efforts of KHS and the World Championship Blacksmiths to orchestrate the event. This event was to be old school in every way possible; we didn’t have a budget for golf carts, or caution tape to keep knowledge seeking Farriers behind the lines. With all contests you want it to be fair and unbiased, but that is simply not enough we needed three judges to be fair and unbiased and be able to convey and explain in an open forum. We had three men for the job and they did exactly that; Shayne Carter, CJF of Payson, Utah, Gerard Laverty, AWCF of Vancouver, British Columbia, and last but not least Conrad Trow, CJF of Shelbyville, Kentucky. 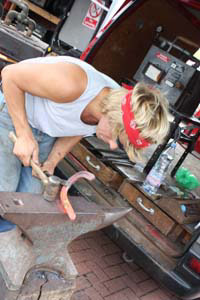 Going into this project all parties involved knew that we had to get the first one out there before the Farrier community would understand what we were trying to accomplish and if our intentions were true to the trade. Americans putting on a team competition meant we had to have a goal in mind that not everyone could see until after it had happened and it affected them, teamwork and humility. In most contests it is important that you execute but in a true team competition it is more important that you formulate a go because to execute is the obvious. The outline was simple - it would be three days of competition. On the first day all teams would shoe a draft horse with ¾ fullered shoes, agricultural turned up heels (Scottish heels) and a toe clip. Each team mate would do one foot and they could use their time anyway they formulated to fit in a 2 ½ hour go. Three judges would judge all aspects of judging; foot prep, shoe making, shoe fit, and final fit and finish, for a score of 1 to 10. This means that there is a total of 120 points possible for each category. 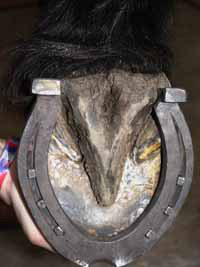 On the second day the teams would shoe a horse with plain stamped bevels on the front with a bob punched toe clip, and a fullered caulkin and wedge with suitable clip behind. The scoring would be the same and the time limit would be the same. On day three the teams would shoe a horse hunter style with tooled and fullered 5/8” square stock. The fronts to be fullered heel to heel with toe clip and hunter heels, and fit to be penny on a penny, and the hinds would be ¾ fullered, quarter clip with a caulkin and wedge. There were no specimen shoes, it was all on the foot and the single most important task that we as farriers do on a day to day basis would win this contest, fit! Argue this fact if you want but fit is what makes all the gimmicks survive and cultivates new gimmicks. If you can read and fit feet you can cut your supply bill in half, and not warehouse gimmicks and substitutions for craftsmanship on your shoeing rig. Now that we have explained what was going on its time to explain what happened. 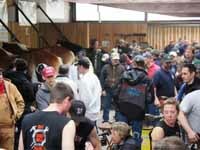 The most educational thing about a shoeing contest is that there are no atta-boys handed out, mostly constructive criticism and pointers on how to do better. When a go is over the three judges might have the only opinion that counts but everyone has an opinion and it flows like wine. 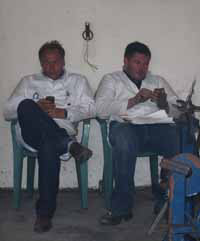 No other format in the farrier world has this type of real time capability, and it is getting pissed away. If the knowledge hungry spectator is kept behind the line and not being able to be in the action then what is gained, can you get an idea of knowing what just happened from 20 feet away, I think not. I don’t care if you’re Billy Crothers or a shoeing school student in their second week you want a peek. Lately contests have strayed away from our strengths and given into our weakness, we just put up a barrier and say you stay out and the competitors stay in, there is no exchange of knowledge in that. Everything we do in the farrier world is observed, retried, and done over and over until muscle memory sets in. The spectators at the WHC were told that they should stay out of the way of the competitors, but other than that they were welcome to get any vantage point they could. Everyone at the competition was respectful of this luxury, they all made way for the competitors and the judges and we had no badge heavy steward wearing a white coat being a buzz kill (these are self filling positions that no one misses ever!) The things that make up a good time for a good contest are good tunes to keep a positive environment, good grub that is Johnny on the spot (food is love), and people who are all heading in the same direction which is obviously to get better, we had this concoction this weekend. Day one started with a very insightful clinic with Conrad Trow demonstrating shoe fit with several cadaver legs. Conrad focused on medial heel fit, lateral heel fit, and fitting the toe with quarter clips and toe clips, after a question and answer session it was time to get the first round started. As we stated in the beginning of this article this was the first team competition of this kind in the U.S. and it showed; you had competitors saying how they just wanted to be part of it and didn’t want to let their teammates down, just be lucky to get done, but when the starting bell rung it took on a life of its own. The trophies for each day would be a replica of the foot that the competitor actually shod made out of wood that Ben Hupp made. The Welsh team finished strong and I mean they finished strong, no team really pulled away with trim and fit, but the Welsh team had pulled away by 12 pts in the finish and got the first day win on the Draft Horses, team Texas was second, and sitting in third was the AFT. The first day left no one discouraged but rather motivated by what they had witnessed, the Welsh team had displayed their experience and teamwork which before this had only been witnessed by a handful in the big picture. Team Texas left no one disappointed either with an all-star team that worked with old school/new school exactness. The second day was the roadster shoeing and it was pretty evident that all the competitors had settled in and they had a new perspective on what it was going to take to win this deal. The day started off with a power point presentation by Gerard Laverty on the correlation between the invention of the assembly line and the demise of the blacksmith trade in North America, very interesting and informative! We reversed the go rounds so if you were in the first round the first day you would be in the second round today. The shoeing in the first round had obviously tightened up from the previous day and it only got tighter in the second round. The Canadians came out to redeem themselves from the previous day and they did just that by winning the Roadster day, with team Texas coming in second, and team WCB rounding out the third spot. The day ended with all the people at the event picking up every foot hundreds of times and rehashing it out over and over again. The third day would start with all four of the top teams staggered 3 points apart, and with 120 points possible in each category it was definitely a horse race. The final day of competition was started off with Shayne Carter welding a Damascus billet, the clinic focused on starting and troubleshooting involved in welding multiple layers of a knife billet. Since Shayne has been consumed by knife making and is going for his journeyman knife makers’ certificate he had a lot to share. The Canadians came out and scored big in the first round with a horse that had been over trimmed several weeks prior and did a marvelous job. It looked like the Canadians had a score that couldn’t be beat the Welsh team drew a horse with feet that would be hard to score on. With a couple of low scores on the hoof prep the Welsh amped it up and did some pretty amazing stuff. While everyone was circle around watching the Welsh go team WCB were quietly having the go of a lifetime on the other end of the floor. 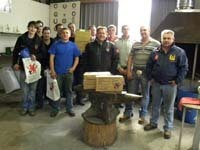 After the smoke had settled team WCB had won the tooled and fullered day, Wales was second and the Canadians were third. No one knew the results of the day and it was close enough to keep it suspenseful for that night at the prize giving. 1st place was Team Wales awarded a Check for $10,000.00 and four belt buckles sponsored by Farrierproducts. The Best Shod Foot Award was for the highest scored foot for the entire weekend went to Billy Crothers with a score of 37. He received a handmade display box and folding Damascus pocket knife, both display and box were made by Scott Davidson. On the fourth day we had a special treat for a special reason. Richard Ellis, a true friend to the farrier community has been diagnosed with cancer and is fighting the big fight. The Welsh team generously donated their time to come give a clinic on behalf of Richard and it was a special event, these four individuals pulled out all the stops and had everyone down on their knees inspecting and observing. The afternoon was a special day that had everyone in attendance understanding a little bit better on how to achieve excellence. The money raised for Richard through that clinic isn’t enough but I can definitely say it was all everybody had, and that was the note for the weekend giving everything you had. I would personally like to thank all the teams for coming out and making it a fun, interactive, learning experience! Our two presenting sponsors that helped raise the booty for the prizes; SAS Global, Inc and Magic Cushion Hoof Packing. Hope to see a few more of you next year because it is definitely onward and upward! To view a great short video of the competition, courtesy of Mustad please click here. 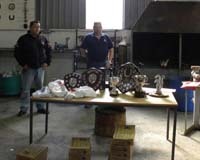 A wet and windy weekend in Cheshire saw the second Middlewich gas shoemaking Competition, held at BL Farrier Supplies LTD and run by Leon Bentham and JC Lee. 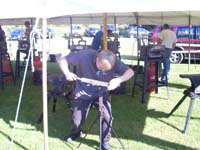 This competition was sponsored by over twenty-four local, national and international businesses, who together donated over two thousand pounds worth of steel, gas and prizes. These sponsors included, BL Farrier Supplies LTD for the use of the yard and all the rosettes, Leggs Brothers for the steel, Calor Gas for the gas, Staffordshire NAFBAE Branch for the loan of eight fires and anvils, Swan Products LTD for the loan of ten fires, Gary Darlow, Simon Bourne and Darren Slater for the loan of anvils. 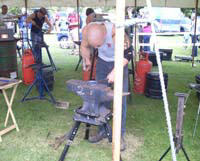 Londonderry Forge Supplies, Jameg, Breakaway Horseshoes LTD, Stromsholm, Handmade Horseshoes LTD (UK), J&A Ferries, Greg Calvert Tools, JC Lee, MNC, Mustad, NWT Farrier Supplies, Jim Blurton Tools, Derek Gardener Tools, Janssen Animal Health all for very generous prizes, Ed Bentham & 1st Timperley Scouts for the food, Leon Bentham for the three trophies and not forgetting Greenwood Photography LTD for the great snaps of the proceedings. 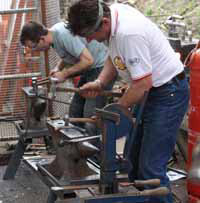 The publicity we were provided by forgeandfarrier.co.uk brought seventy-six competitors travelling many miles to take part and make this competition an excellent event. 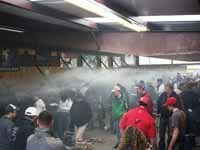 There were nineteen gas fires blazing all day so the competitors had no chance of getting cold on this wet February day. With the daylight hours on our minds and ten classes over twenty-two rounds to get through there was a big worry of it going dark before we had finished the day’s work. 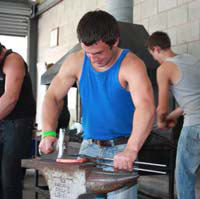 Local Farrier Terry Hargreaves kindly gave up his Sunday and once again excelled as Chief Steward keeping all the apprentices in order and on time whether they liked it or not. Over on the other eight fires there was a slight glitch with the smooth running of the proceedings after one of the gas pipes decided to catch fire spilling flames out across the marquee. As competitors scarpered in every direction a big thank you should go out to Matt Randles for passing Leon the fire extinguisher and saving him from burning his arm further whilst trying to turn the bottle off. Disaster averted there was a fifteen minute delay as a new pipe, regulator and bottle were sourced. We would also like to Terry Hargreaves again for prompting us earlier in the day put some fire extinguishers around the event. More care and attention to health and safety will be taken next year and also more space in the tents for the competitors to work. The judges Jon Nunn (Open Shoemaking Champion 2010) and David Lynch (Intermediate Shoemaking Champion 2010) had a tough job marking over four hundred shoes from the ten classes between them, but they did a superb job and both provided excellent specimens for the competitors to work to. Lunch was provided by Ed Bentham who had the mammoth job of peeling potatoes and chopping onions for over two hundred portions of corned beef hash. A new award was provided by Lucy and Billy from Handmade Shoes (UK) LTD for the best improved apprentice, we came to the result by taking away last years result from this years and the apprentice with the highest difference won the Handmades vice and vice stand. The result was also backed up by our judge Jon Nunn who agreed this was a fair way and with a remarkable score difference of 4.3 points improvement from last year Fred Turner-Handley was a deserving winner. Another big thanks for all who were involved in the event and we hope to see you again next year. 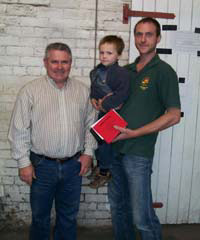 Special Prize :- Tankards To Winning Pair Apprentice Team - Harry Meek & Robbie Watson-Greaves. in 2008 before Beane went on his current run. added Beane. “With the jet lag, I average only four hours of sleep a night here. So I’ve got to be fit. I’ve got to be focused. Beane takes home the winner’s cheque for $10,000, as well as a gold-and-silver Stampede championship buckle, a limited edition bronze trophy, and a champion’s jacket. Final standings showed Beane with 152 points. Robinson was second with 115 points, Derek Gardner of Scotland placed third with 111, Crothers was fourth at 102 and Moon finished fifth at 95.Nathan Powell of Water Valley, Alta., was the top Canadian, finishing 10th overall. The WCBC has not crowned a Canadian champion since Bob Marshall in 1986. Henrick Berger of Denmark, Scotland’s David Varini, Jim Quick of the United States, and Yoann Policard of France also made the top 10. Champion, pocketing the same amount. Doug Taylor of Blackfalds, Alta., took home Artistic Champion honours, while Jason Bromley of the United States was named Rookie of the Year. Many thanks to all who supported and travelled long distances to compete again this year, even with an event at head office our entries where full, with top farriers and apprentices from all over the country. Very well done Gary Darlow for winning back to back championships Thanks to Grant Moon and Jim Ravenscroft for judging, both had a hard time finding winners. As always thanks to our sponsors Jim Blurton Tools for there continued backing in these tough economic times, and the Royal Bath &West Society for the use of the best shoeing floor in the country. And our horse owners for some champion hunters to shoe We look forward to next year with thoughts of making the competition bigger and better by adding in some more classes if at all possible.